The angel says, "Do not be afraid. Why are you seeking the living among the dead? Jesus is not here; he is risen." HE HOURS OF watching dragged slowly by to the Roman soldiers who guarded the tomb where the body of Jesus lay. No one had come even to visit the grave; and perhaps the soldiers laughed at the fears of the Jews. The eastern sky was beginning to light up with the promise of a new day when suddenly the ground beneath the watcher's feet began to tremble. Another earthquake had come. Then the fearful watchers saw a mighty angel come down from the sky and roll the stone away from the door of the tomb and sit upon it. The face of this angel had the appearance of lightning, and the garments he wore were as white as snow. At sight of him the soldiers fell to the ground, trembling and helpless, and lay there as if they were dead. All this happened because Jesus had, in the grave, come back to life. He was risen from the dead. 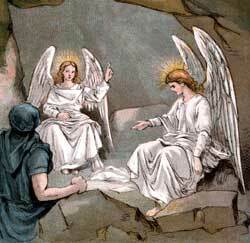 When the women came to the garden they found the tomb empty, and the angel had not yet gone back to heaven. At first the women did not see the angel, and they wondered who had come and stolen the body of their Lord. Mary Magdalene left the others and ran quickly to tell Peter and John that the body of Jesus had been taken away from the tomb and hidden they knew not where. After Mary had gone from them, the other women saw in the empty tomb the beautiful angel, and they were afraid and bowed themselves to the ground. But the angel said, "Do not be afraid. Why are you seeking the living among the dead? Jesus is not here; he is risen as he said. Go quickly and tell his disciples and Peter that he is alive and will meet them in Galilee." The women ran from the place, filled with joy yet trembling with excitement and fear. The good news which the angel told seemed too wonderful to be true, still they believed and hurried to tell the disciples and other friends who were sorrowing. But the disciples refused to believe the glad message. Peter and John ran to see the empty tomb for themselves, and when they came to the place they found no one, for the soldiers had risen and fled into the city to tell their strange experience to the enemies of Jesus who had stationed them to watch by the grave. John outran Peter, and coming first to the grave he looked and saw it was empty. Then Peter came, and he went into the dark room where the body of Jesus had lain. He saw there the grave-clothes that Joseph had wrapped round the body of Jesus, and he believed that surely Jesus was alive once more. John, too, entered the grave and saw the clothes lying where Jesus had left them, and he also believed. Mary Magdalene had not stayed in the garden long enough to hear the message of the angel, and now she returned from the city, longing to find the place where her crucified Lord had been taken. She did not yet know of the new hopes that were gladdening the hearts of her friends. Entering the garden again, she stood by the empty grave and wept. Then she stooped down and looked into the grave and saw two angels sitting, one at the head and another at the foot of where the body of Jesus had lain. They said to her, "Woman, why are you weeping?" She replied, "Because they have taken away my Lord and I do not know where they have laid him." Then turning about she saw Jesus himself standing near. But tears blinded her eyes, and she did not know him. He, too, asked her why she wept, and supposing him to be the man who cared for the garden, she said, "Sir, if you have carried away my Lord, tell me where you have laid him that I may take him." Then Jesus said, "Mary!" and she knew his voice. What glad joy filled Mary's heart when she knew that Jesus was speaking to her again. She fell at his feet and cried, "Master!" Then he told her to go at once and tell her sorrowing friends that she had seen him and that he had told her to tell them he was going to ascend to their heavenly Father's home. While these things were happening, the soldiers came into the city and told the chief priest what had taken place in the garden tomb. And the chief priests were alarmed. They quickly called the other enemies of Jesus; and they all wondered what to do. They had no thoughts of accepting Jesus even though he had truly risen from the dead. They still hoped to persuade the people that Jesus had been a false prophet, so they decided on a plan and they asked the soldiers to help them carry it out. They offered them much money if only they would promise to tell no one else that Jesus had risen and an angel had opened the tomb. They urged the soldiers to tell the people that the disciples came and stole Jesus' body away while they were lying asleep. The Roman soldiers cared nothing about the Jews and their religion, and they gladly took the money and went away. And when they were questioned about the disappearance of Jesus' body from the grave they said the disciples had stolen it while they slept.